Sayed Hashem Alawi is a 22-year-old student at the University of Bahrain. He was arrested and tortured by authorities and subjected to an unfair trial. Sayed was the first defendant of 14 in the “February 14 Coalition” cases, referring to a largely informal online group which the Bahraini government has designated a terrorist organization. He is currently being held in Jau Prison. On 17 May 2017, Sayed Hashem was summoned to appear in court on charges of illegal assembly and manufacturing explosives. Sayed Hashem failed to appear and became wanted by authorities. On 26 February 2018, in a separate case, riot police officers, some wearing masks, arrested him at a relative’s home, along with two other individuals. They were arrested without a warrant and were not given a reason for the arrest. According to reports, National Security Agency (NSA) vehicles were also present at the scene. Officers took Sayed Hashem to the Criminal Investigations Directorate (CID), where they disappeared him for a week and interrogated him for two weeks, during which time they tortured him to coerce a confession. His lawyer was not allowed to attend the interrogation sessions. Officers blindfolded, handcuffed, and shackled Sayed Hashem during the entire interrogation period, and beat him all over his body. In addition, they forced him to sign a false confession while blindfolded, which was subsequently used against him at trial. As a result of the torture he was subjected to, Sayed Hashem suffers from back pain and a wound in his mouth. Detaining authorities denied Sayed Hashem’s request to see a doctor. Sayed Hashem was presented before the Office of Public Prosecution (OPP) two weeks after his arrest, after which he was transferred to Dry Dock Detention Center. Sayed Hashem was not brought promptly before a judge and he was denied access to his attorney during this period, preventing him from adequately preparing for his trial. Sayed Hashem was charged with joining the “February 14 Coalition,” harboring a fugitive (one of the individuals arrested with him), filming a burning car, establishing and financing a terrorist group, and espionage. On 27 July 2018, he was sentenced to five years in prison for filming the burning car; on 30 September 2018 to three years for harboring a fugitive; and on 27 December 2018 to life in prison and the revocation of his citizenship for the “February 14 Coalition” charge. The sentences for the first and second charges were upheld on appeal, and the appeal for the third charge is scheduled for 21 April 2019. Bahrain’s actions against Sayed Hashem violate international law, including the International Covenant on Civil and Political Rights (ICCPR) and the Convention against Torture and Other Cruel, Inhuman or Degrading Treatment or Punishment (CAT), and the International Covenant on Economic, Social and Cultural Rights (ICESCR), all of which Bahrain has acceded to. In addition, Bahrain has contravened principles of international law laid out in the Universal Declaration of Human Rights (UDHR). 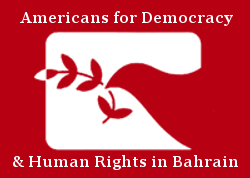 Americans for Democracy & Human Rights in Bahrain (ADHRB) calls upon Bahrain to uphold its human rights obligations by annulling Sayed Hashem’s conviction, releasing him from arbitrary detention in accordance with international law, and if serious criminal charges can be maintained against him, ensuring that any subsequent trial is consistent with due process and fair trial rights. In addition, we urge the authorities to investigate claims of torture and ill treatment by CID officers, to hold those officers accountable, and to ensure medical care is granted to all detainees who request it.